This article is about the metropolitan area in Oregon and Washington. 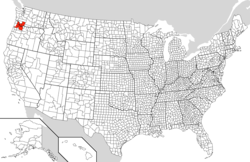 For the metropolitan area in Maine, see Portland metropolitan area, Maine. In 2010 the median income for a household in the MSA was $53,078 and the median income for a family was $64,290. The per capita income was $27,451. The Portland–Vancouver–Hillsboro Metropolitan Statistical Area (MSA), the 23rd largest in the United States, has a population of 2,226,009 (2010 Census). Of them, 1,789,580 live in Oregon (46.7% of the state's population) while the remaining 436,429 live in Washington (6.7% of state's population). It consists of Multnomah, Washington, Clackamas, Columbia and Yamhill counties in Oregon, as well as Clark and Skamania counties in Washington. The area includes Portland and the neighboring cities of Vancouver, Beaverton, Gresham, Hillsboro, Milwaukie, Lake Oswego, Oregon City, Fairview, Wood Village, Troutdale, Tualatin, Tigard, West Linn, Battle Ground, Camas and Washougal. The Portland–Vancouver–Salem, OR–WA Combined Statistical Area (CSA) 2015 population estimate is 3,110,906, ranked 18th largest in the United States (2,921,408 based on the 2010 Census). This area includes the Portland–Vancouver–Hillsboro, OR–WA Metropolitan Statistical Area; Salem, OR Metropolitan Statistical Area, and other surrounding areas. Changes in house prices for the metro area are publicly tracked on a regular basis using the Case–Shiller index; the statistic is published by Standard & Poor's and is also a component of S&P's 20-city composite index of the value of the U.S. residential real estate market. Major cities in the region in addition to Portland include Beaverton, Gresham, Hillsboro in Oregon, and Vancouver in Washington. The area also includes the smaller cities of Corbett, Cornelius, Damascus, Fairview, Forest Grove, Gladstone, Happy Valley, King City, Lake Oswego, Milwaukie, Oregon City, Sherwood, Tigard, Troutdale, Tualatin, West Linn, Wilsonville, Wood Village in Oregon, as well as Battle Ground, Camas, Washougal, Ridgefield, La Center and Yacolt in Washington. It includes the unincorporated suburban communities in Oregon of Aloha, Beavercreek, Cedar Mill, Clackamas, Dunthorpe, Garden Home, Raleigh Hills, and West Slope, as well as Hazel Dell, Minnehaha, Salmon Creek, Walnut Grove and Orchards in Washington. Portland is where Interstate 84 ends at Interstate 5, both major highways in the Pacific Northwest. Other primary roads include Interstate 205, an eastern bypass of the urban core, U.S. Route 26, which heads west and southeast, U.S. Route 30, which follows the Oregon side of the Columbia River northwest and east, mirrored by Washington State Route 14 east from Vancouver, and Oregon Route 217, which connects US 26 with I-5 in the south, travelling through Beaverton. Both US 26 and US 30 go to the Oregon Coast. SR 500 runs from Interstate 5 to SR 503. Padden Parkway runs from NE 78th St and east to NE 162nd Ave. Transit service on the Oregon side is generally provided by TriMet. In addition, Sandy Area Metro serves Sandy, South Clackamas Transportation District serves nearby Molalla, Canby Area Transit serves Canby and South Metro Area Regional Transit serves Wilsonville. Service in Clark County is provided by C-Tran. In Columbia County, the Columbia County Rider provides transit service on weekdays connecting St. Helens with downtown Portland and connecting Scappoose and St. Helens with certain points in urban Washington County, including the PCC Rock Creek campus, Tanasbourne and the Willow Creek MAX light rail station. Notable highways never built, or removed altogether, include Mount Hood Freeway, Interstate 505, and Harbor Drive. The Portland MSA is home to a number of professional and semi-professional sports teams, including the NBA's Portland Trail Blazers, the Portland Timbers of Major League Soccer, and the Portland Thorns of the National Women's Soccer League. Other teams include the Portland Pickles and the Hillsboro Hops. Portland is also home to two NCAA Division 1 universities, the Portland State Vikings and the Portland Pilots. The Portland MSA also hosts a number of amateur sports, including college and high school sports. The high school rugby championships are held annually in the Portland MSA, and draw crowds of 8,000 to 10,000 supporters. ^ "Update of Statistical Area Definitions and Guidance on Their Uses" (PDF). Office of Management and Budget. November 20, 2007. p. 45. Archived from the original (PDF) on November 17, 2008. Retrieved 2008-09-05. ^ "2010 Census Urban Area Reference Maps". USCB, Geography Division. Retrieved March 20, 2015. ^ "A national, state-sorted list of all 2010 urbanized areas and urban clusters for the U.S., Puerto Rico, and Island Areas first sorted by state FIPS code, then sorted by UACE code". USCB, Geography Division. Retrieved March 20, 2015. ^ "Jurisdictional Boundaries". Metro. Retrieved 2011-08-01. ^ "Profile of General Population and Housing Characteristics: 2010". factfinder2.census.gov. US Census Bureau. Archived from the original on December 5, 2012. ^ "Hispanic or Latino by Type: 2010". factfinder2.census.gov. US Census Bureau. Archived from the original on December 5, 2012. ^ US Census Bureau. Factfinder2.census.gov. Retrieved on 2013-10-05. ^ "Table 1. Annual Estimates of the Population of Metropolitan and Micropolitan Statistical Areas: April 1, 2000 to July 1, 2008". Archived from the original on July 31, 2009. Retrieved September 2, 2016. ^ "OMB Bulletin No. 10-02: Update of Statistical Area Definitions and Guidance on Their Uses" (PDF). United States Office of Management and Budget. December 1, 2009. Retrieved January 18, 2010. ^ "Annual Estimates of the Resident Population: April 1, 2010 to July 1, 2015 - United States -- Combined Statistical Area; and for Puerto Rico". USCB, Population Division. March 2016. Archived from the original on August 15, 2014. Retrieved March 22, 2016. ^ "Schedules & Routes". Columbia County Rider. Archived from the original on 2014-08-16. Retrieved 2014-06-12. ^ Young, Bob (March 9, 2005). "Highway to Hell". Willamette Week. Retrieved November 20, 2016.